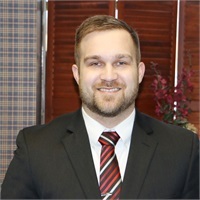 Dustin Rhoades | Wealth Strategies, Inc.
Dustin joined the Wealth Strategies team in April of 2014 and is a member of the Enhanced Service Team. Dustin is fully licensed to sell Life, Accident, Health, Disability, and Long-Term Care Insurance. Dustin was born in Muncie, Indiana, where he attended Muncie Central High School. After graduating, he attended Ball State University where he studied history and graduated in the fall of 2012. Dustin currently resides in Muncie with his wife, Jessica, daughter, Ryleigh, and their two dogs Pax and Zeus. In his free time, Dustin enjoys sports and spending time with family and friends.